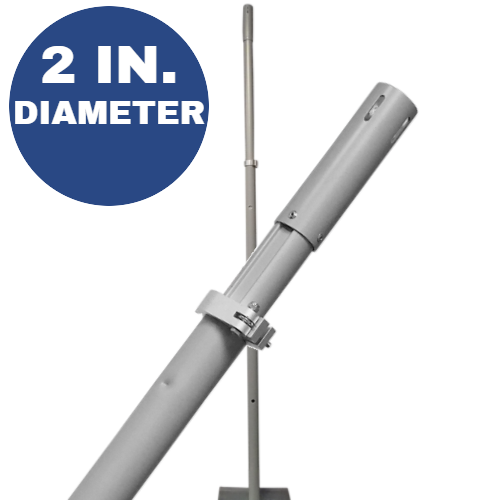 Adjustable to any height between 9 feet tall and 16 feet tall (108 inches to 192 inches). Button stop allows the height to quickly be set at any foot interval: 10 feet, 11 feet, 12 feet, 13 feet, 14 feet, 15 feet, and 16 feet tall. Locking Clamp lets you set an "in between" height that isn't at an even foot interval (for example, 15 feet 8 inches tall). 2 inch diameter silver aluminum pipe means less weight and easy set-up. Four slots in the top at 90 degree angles allow for various configurations such as continuing a linear span, making right angle turns, creating "L" shapes, etc. 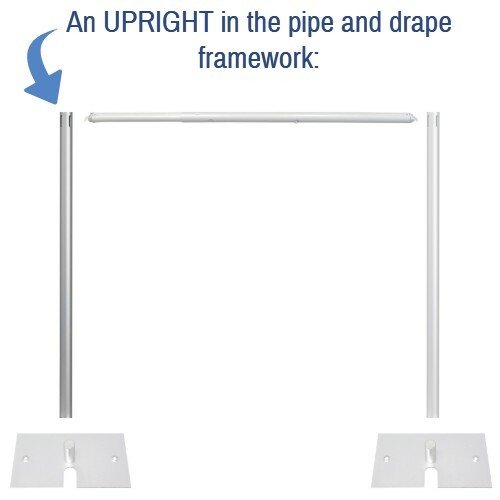 This hollow upright works with our Slip-Fit system, allowing for easy installation over our base pins (for 2 inch diameter Uprights). The minimum size/weight base recommended for this upright is our Heavy Duty 18" x 18" (35 lb) base. This item must ship by freight due to its size, and is not eligible for FREE SHIPPING.